Desolation of Dragons társasjáték - Magyarország társasjáték keresője! A társasjáték érték! A Desolation of Dragons egy kiváló társasjáték, 1 - 6 játékos részére, az átlagos játékidő rövidebb, csak 30 - 60 perc. A társast, 10 éves kortól ajánljuk kipróbálni. A játékmenet erősen épít a kollekció gyűjtés és a moduláris tábla mechanizmusokra. Looking down from the sky we could see their buildings, their city as they call it. Many of us had fallen in the long fight to reclaim our lands and this day was going to be our day. The day when we finally drove them away! We had joined forces and piece by piece we were going to destroy this city until it all lay in ruins. If lucky, maybe even grab some gold and treasure. After all, a dragons lair need loot too. In this game you destroy a human city by removing tiles, one at a time around the table to score as much points as possible. You will need to collect as many different colors as possible and as many of one color as possible to score most points. The tiles eligible are limited every round so you need to choose what gives you most points, both in scoring and set collection for the end game score. Some buildings also have loot, gems or gold, powerful magic artifacts that you can use and if you silence the bell tower, you can make another swift attack. In each game the city will be built differently, so good variaton to the set up. Simple game play with good tactical depth makes it quick, easy and fun to play. The game also includes a RoboDragon for solo play where you can play to beat the RoboDragon or your own personal high score. 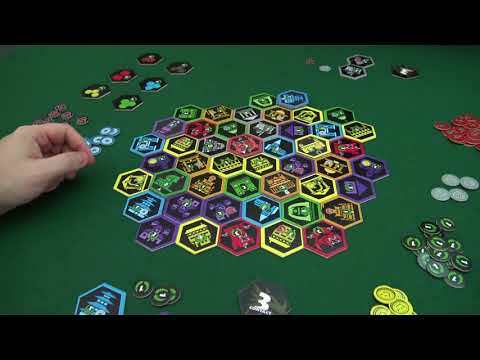 It can also be used as an additional player in a 2-5 player game. Will be available in Q1 2019. Send me an e-mail mjgames@telia.com if you would like to get updates. Desolation of Dragons "playthrough and how to play"